The trio of royal sisters in Denmark -- Queen Margrethe, Princess Benedikte, and Queen Anne-Marie -- have an amazing treasure trove of heirloom Scandinavian royal jewels in their possession. 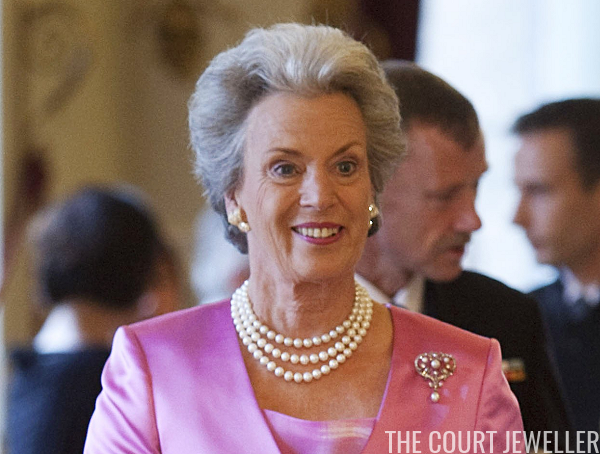 Today, we're talking about a lovely bauble, Princess Benedikte's Diamond and Pearl Scroll Brooch, that traces back at least two more generations in the family. 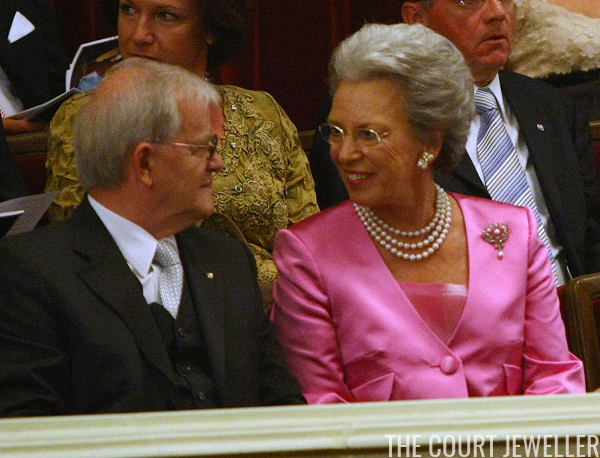 Benedikte has had the brooch in her jewelry box since 1969. That year, she gave birth to her first child, Prince Gustav of Sayn-Wittgenstein-Berleburg. To mark the occasion, Benedikte's mother, Queen Ingrid of Denmark, gave her daughter this brooch. Historians debate about the exact provenance of the brooch. Bjarne Steen Jensen, author of a book on Denmark's royal jewels, argue that that the brooch belonged to Ingrid's mother, Margaret of Connaught. I've also read, however, that the brooch came from Benedikte's paternal grandparents, and was a gift from King Christian X of Denmark to his wife, Queen Alexandrine. Benedikte first wore the brooch for baby Gustav's first official portraits. Since then, the piece has become a versatile staple in her jewelry wardrobe. She often wears it as a traditional brooch, as she did during Queen Margrethe's 2009 visit to Germany. Above, during the 1995 wedding celebrations for her nephew, Prince Joachim of Denmark, she uses the brooch in another way: as a pendant on her pearl necklace. She wore the brooch in the same pendant configuration on a single-stranded pearl necklace for a dinner at Christiansborg Palace in 2006. For Joachim's wedding, she wore the pendant with the Sayn-Wittgenstein-Berleburg Fringe Tiara; on this occasion, however, she paired it with her own Floral Birthday Tiara. 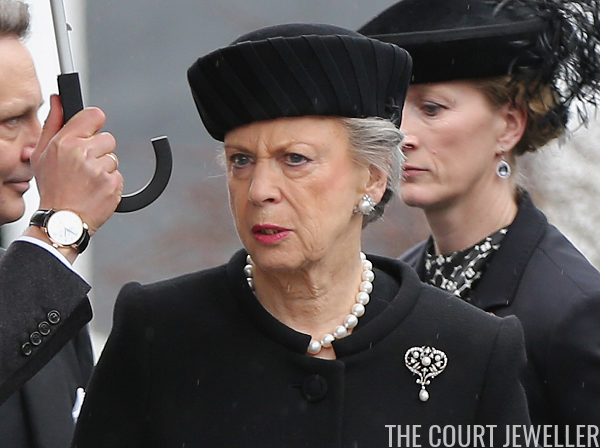 The brooch's scroll shape bears a strong resemblance to a heart, so it shouldn't be surprising that Benedikte has worn the piece at funeral services for two of the people she loved most. Above, she wears the scroll brooch for the funeral of her mother, Queen Ingrid, in 2000. And in 2017, she wore the brooch at the funeral of her husband, Prince Richard of Sayn-Wittgenstein-Berleburg, who died quite suddenly at the age of 83. The gesture, literally wearing her heart pinned to her coat, was a lovely, sentimental statement during the celebration of Richard's life.